To flatten each chicken breast half, place, boned side up, between 2 pieces of plastic wrap or waxed paper. Working from center, gently pound chicken with flat side of meat mallet or rolling pin until about 1/4 inch thick. Place chicken in shallow nonmetal dish or resealable food storage plastic bag. Add Italian salad dressing; turn to coat. Cover; refrigerate 1 hour. Heat grill. When ready to grill, place chicken on gas grill over medium heat or on charcoal grill 4 to 6 inches from medium coals. Cook 8 to 10 minutes or until fork-tender and juices run clear, turning once. Toast focaccia, cut sides down, during last 3 to 4 minutes of cooking time. In large bowl, combine lettuce, olives and Caesar salad dressing; toss to coat. Arrange cooked chicken on bottom half of toasted focaccia. Top with lettuce mixture, tomato slices and top half of focaccia. Cut into wedges to serve. To broil chicken, place on broiler pan; broil 4 to 6 inches from heat using times above as a guide, turning once. Place focaccia on broiler pan, cut sides up, during last 3 to 4 minutes of cooking time. 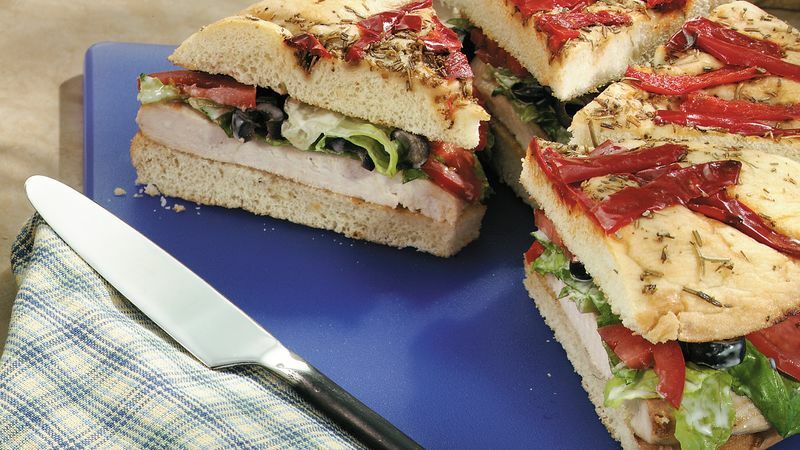 If your focaccia measures less than 10 inches across, use less chicken and salad filling so the sandwiches remain easy to eat. To reduce the fat in each sandwich by about 5 grams, substitute light Caesar salad dressing for regular dressing. To save the time of washing and trimming the romaine, purchase romaine salad mixture or washed romaine hearts from the produce section of the grocery store. To easily cut and handle the focaccia wedges, evenly space six 6-inch skewers around the loaf, two inches from the edge. Cut between the skewers, then arrange the wedges on a platter or on plates. Remove the skewers before serving the wedges.